The HTC One SV supports multi-touch and you can take full advantage of it while browsing your images. You can zoom up to 100% with a simple double tap on the screen. The implementation here is extra smooth too. There's no dedicated video player onboard the HTC One SV, which means that video files have to be accessed via the Gallery. Video support on the One SV was a mixed bag - as expected, 1080p videos were a no go and 720p were quite choppy. It was able to play most standard resolution file formats we threw at it - AVI, MP4, MKV - though it did choke on some old XviD-encoded AVI videos. DivX had problems with audio sync but worked fine with AAC audio. Speaking of audio, you can choose between Beats Audio, HTC enhancer or No effects (as long as you are using a pair of headphones). The Music app starts off by offering you several shortcuts - music library on the phone, SoundHound track recognition, TuneIn Radio or 7digital. The One SV offers the Beats Audio sound enhancement to boost the sonic experience, although at a slightly dumbed-down variant. Gone are all the Beats Audio presets we're used to in other HTC Beats phones, all you're really able to do on the One SV is toggle it on and off. 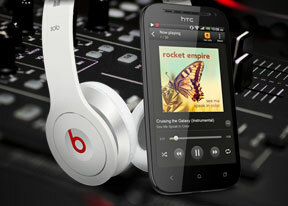 The HTC One SV is also equipped with an FM radio, which has a pretty simple interface. It automatically scans the area for the available stations and allows you to mark some of them as favorite. It also supports RDS and allows loudspeaker playback. You can play the sound through the headphones or the loudspeaker, although you need to have a headset plugged in at all times as it's used as an antenna. There's no Beats enhancement here though, or a playback control card on the lockscreen. If you have a data connection, you can use TuneIn online radio instead of relying on your local FM radio stations. 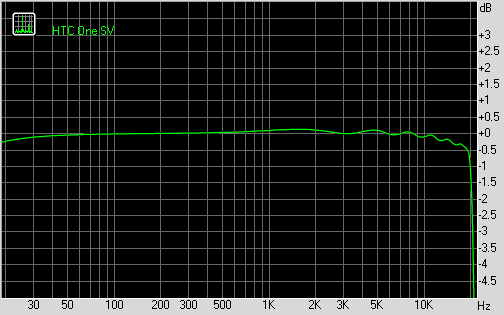 The HTC One SV audio output came out pretty good. The smartphone had excellent frequency response and garnished it with good dynamic range, noise level and stereo crosstalk readings. The volume levels were only average, but since the distortions were kept well under control the overall performance is more than satisfactory. Here go the results so you can see for yourselves.